Bike Rodeo for kids, led by the Topeka Police Department, the Kaw Valley Bicycle Club, and instructors certified by the League of American Bicyclists. Kids will have the chance to try out a skills course, and learn some of the key tenets of bicycle safety. In conjunction with the Bike Rodeo, Heartland BMX will be demonstrating their fleet of balance bikes. These are small bicycles without pedals, designed to help kids safely learn the balance required to ride a larger bike. They are lighter and easier to maneuver than tricycles or bikes with training wheels. For those interested, there will also be a chance to win one of these bikes – a “Lil Raskal” pushbike from Sun Bicycles, a $64.99 value. The Shawnee County Health Agency will be sharing information on local initiatives, including the Bike for Discounts program. Helmets provided by a grant from Safe Kids Shawnee County will be available, and volunteers will be present to help fit helmets. A third group, Safe Streets, will be promoting their “Lock it, remove it, or lose it” campaign. Topeka and Shawnee County Public Library’s Adventure Mobile will be stationed in the district, bringing the featured animal of the week, and sharing information about summer reading programs from the Library. Across from the Adventure Mobile, a Topeka Metro fixed-route bus will be on hand, inviting visitors to step aboard and experience a 35-foot city bus firsthand. 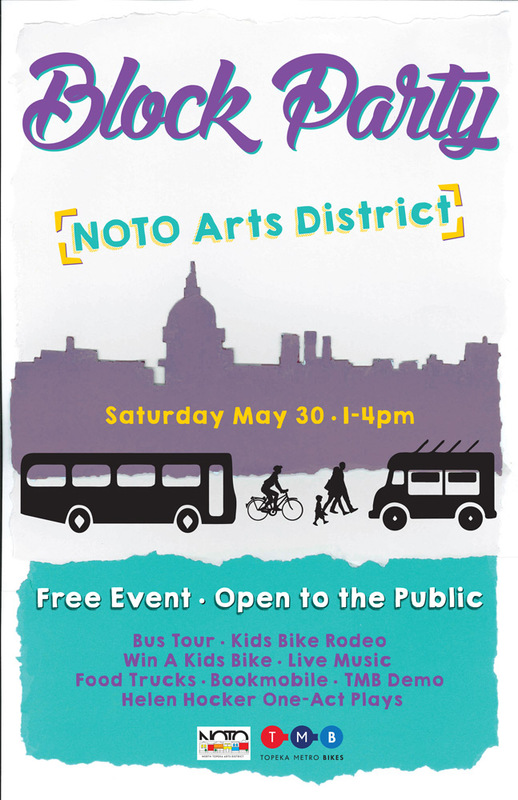 Businesses and galleries in the NOTO Arts District will be open, and several other vendors and exhibitors will be present during the event.